Cross Stitch and Needlepoint from Pegasus Originals, Inc. Needlework including counted cross stitch, needlepoint, quilting, candlewicking, chicken scratch, duplicate stitch, stitchery, embroidery, Marty Bell, charted designs, kits, leaflets, dogs, cats, horses, wildlife, animals. A total of 63 records matched your search. "Marty Bell has written many beautiful poems. This cross stitch sampler surrounded by Marty's roses is the first publication of her poetry ever. The words to this poem can be found at http://pegasusor.com/393.html "
Marty Bells Brendas Porch, shows a porch swing surrounded by beautiful flowers. Sit down, stitch and relax a while. Marty Bells Brendas Porch, shows a porch swing surrounded by beautiful flowers. Sit down, stitch and relax a while. Kit includes 14 count fabric, charts, instruction, picture, presorted DMC floss and needle. "A beautiful English cottage and garden. This is the companion piece to ""Mornings Glow"". " "A quaint English cottage set in a lovely garden. " 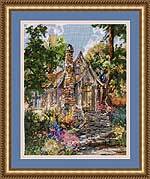 Item Number: 470 Counted Cross stitch Colors: 93 Stitch Count: 198W X 156H One of England's beautiful cottages is brought to life here by Marty Bell. Translated for cross stitch by Stephanie Hedgepath. 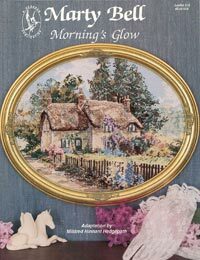 Item Number: 470 Counted Cross stitch Colors: 93 Stitch Count: 198W X 156H One of England's beautiful cottages is brought to life here by Marty Bell. Translated for cross stitch by Stephanie Hedgepath. Kit includes 14 count fabric, charts, instruction, picture, presorted DMC floss and needle. "A beautiful English cottage surrounded by a brick wall, trees and a variety of colorful flowers." Marty Bells Elegance Of Spring is a beautiful lady with Spring flowers and a long flowing dress. The model is shown stitched on 14 ct. Fiddlers Blue Aida fabric from Charles Craft, Inc., using 2 strands of floss to cross stitch. Seed beads are used as buttons on the back of the dress. (Chart Pack) This is a great companion piece to Sweet Blue. Marty Bells Elegance Of Spring is a beautiful lady with Spring flowers and a long flowing dress. The model is shown stitched on 14 ct. Fiddlers Blue Aida fabric from Charles Craft, Inc., using 2 strands of floss to cross stitch. Seed beads are used as buttons on the back of the dress.This is a great companion piece to Sweet Blue. Kit contains: 14 count Aida fabric, presorted floss, needle, chart and instructions. Marty Bell's Enticing Item Number: PO444 Colors: 79 Stitch Count: 87W X 170H Marty Bells Enticing was stitched on 14 ct. Aida. Adapted for charted design from a painting by Marty Bell. This is a large, detailed piece that is bursting with flowers- in pots, in hangers, in barrels and cascading over the roof of this old Mill Pottery Cottage. A quaint little English cottage set in a beautiful English garden. 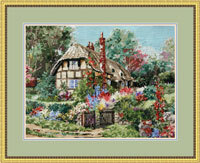 Hollybush Cottage by Marty Bell Category:Counted Cross-Stitch Item Number: PO464 Another great addition to the Marty Bell cross stitch series. Beautiful cottage tucked back in its own glowing garden. Stitch Count is 240W x 185H. "A beautiful brick farmhouse and flower garden.A great companion piece to Somerset Inn. " Kit includes: charted design,instructions, picture,seperated and carded DMC floss, 14 count fabric and needle. "A beautiful brick farmhouse and flower garden.A great companion piece to Somerset Inn. " New Marty Bell Cross Stitch Design Item Name: Idaho Hideaway Category: Cross-Stitch Item Number: 449 Colors: 97 colors Stitch Count: 200W X 160H Idaho Hideaway is the newest chart pack released from Pegasus Originals, Inc.
New Marty Bell Cross Stitch Design Item Name: Idaho Hideaway Category: Cross-Stitch Item Number: 449 Colors: 97 colors Stitch Count: 200W X 160H Kit includes: charted design,instructions, picture,seperated and carded DMC floss, 14 count fabric and needle. This design was inspired by Martys granddaughter years ago on an afternoon of dress-up in the garden. That little girl is now a lovely young lady but the early image lives on. This beautiful book contains 6 designs from the focal points of Marty's popular paintings. Three are shown here . 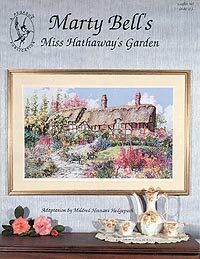 The designs are taken from: Miss Hathaway's Garden Sweetheart Thatch Tuck Box Tearoom Sanctuary Somerset Inn Ready for Christmas"
William Shakespeare wooed Ann Hathaway in this lovely garden so long ago. This is the most popular cottage in the world. This is the most popular garden in the world and visitors come from all over to visit the famous Hathaway garden where William Shakespeare wooed Ann Hathaway long ago. Stitch Count 325 x 200 Kit includes Separated and carded DMC floss,14 count Fabric , Needle, instructions and charted design. "This quaint English cottage shows off the beauty of the English countryside. Beautiful flower gardens. " A beautiful English cottage and garden with a lovely view over water. A beautiful English cottage and landscape. A small English church hidden in a garden of trees and flowers. Come sit on the porch and enjoy the flowers. The tea is on the table. What a nice place to sit and stitch. Of couse you know the cat will soon be in your lap, so enjoy the tea and the wind chime as the gentle breeze blows across the porch. Colors: 84 Stitch Count: 188W X 149H Kit includes 14 count fabric, charts, instruction, picture, presorted DMC floss and needle. "A beautifully landscaped English cottage. " Marty Bell's Quiet Garden Item Number: PO445 Colors: 81 Stitch Count: 89W X 172H Marty Bells Quiet Garden was stitched on 14 ct. Aida. Adapted for charted design from a painting by Marty Bell. A beautiful den decorated and "Ready For Christmas". Complete with candles, garland and a fully decorated Christmas Tree. The Maxwell Mansion in Georgetown, Colorado is considered one of the top ten Victorian homes in America. It's nestled in the breathtaking Colorado Rockies. The stitch count on the cottage design is 179 by 139 high. The Bower Roses shown on the right are 63w by 77h and the Cottage roses on the left are 59w by 79h. This will make a beautiful set with the two companion roses framed and hung on the sides of the cottage. Rose Bower Cottage has two bonus deigns in addition to the cottage. We have included two of Marty's Beautiful Roses. The stitch count on the cottage design is 179 by 139 high. Kit includes: charted design,instructions, picture,seperated and carded DMC floss, 14 count fabric and needle. A beautiful stone church front with a stone wall and iron gate. Item Name: She Walks in Beauty Item Number:443 Stitch Count: 150W X 197H Marty Bells She Walks in Beauty was stitched on 28 ct. Black fabric by Zweigart®, using 2 strands of floss over two threads of fabric to cross stitch. The face and hands are charted for either stitching over 1 for great detail or over 2. Beads also accent the design. Come sing the joyous songs of Christmas at this little village house and when you are though, have a cup of hot cocoa with us inside by the warm fire. Colors: 80 Stitch Count: 120W X 154H. Kit contains: 14 count Aida fabric, Presorted DMC floss, Needle, Chart and Instructions. An upclose look at an inviting English countryside Inn. Splashes of color, peaceful seclusion... Enjoy this country garden with your very own dreams. Colors: 73 Stitch Count: 134W X 167H Kit includes: charted design, instructions, fabric pre sorted DMC floss, picture and needle.